When I was in the seminary, my classmates and I would sometimes ponder different ways that some of the Gospel stories could end so as to better draw out some of our doctrinal teachings that we hold as Catholics. This Gospel passage concerning the woman caught in adultery is a perfect example. See if you can figure out what doctrine we thought an alternative ending to the Gospel passage could highlight. We all know the story - our Lord says, he who has not sinned be the first to cast a stone and slowly and dramatically, each of the scribes and the Pharisees back-off, beginning with the elders. here's the alternative ending: then, out of nowhere, a stone comes sailing through the air and hits the woman caught in adultery in the back of the head, knocking her unconscious. Jesus looks up and peers into the crowd and cries out in an exasperated voice "Mom!" Our Lord finds Himself in a bit of a trap in our Gospel today. The motivation of the scribes and the Pharisees is malicious - St. John recounts that they were looking for a way to trap him. They are not interested in the truth, but only in finding a way to get Jesus arrested for views subversive to the Jewish faith. What our Lord does is really quite brilliant: first, he shows that morality is the basis for any law. Second, he reveals to us how mercy and justice work in God. In showing that morality is the basis for law, our Lord tells us that laws should not be pursued as an end unto themselves. Even the moral law of the Church is not an end unto itself. We should be following the moral law of the Church because the moral law is based in Gospel truth and it intends to set us free by helping us to live as God would want - to experience the freedom that the law of Christ, which is the law of love, provides for us. 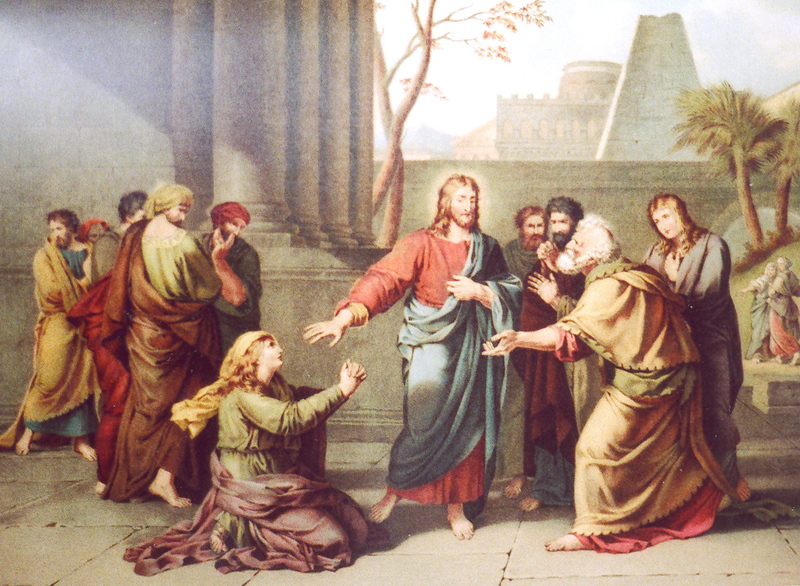 When Jesus is presented with the case of the woman caught in adultery, he is asked to choose between justice and mercy. Here's the trap: if he chooses justice over mercy, then our Lord allows the woman to be stoned and displays a lack of mercy. If he chooses mercy over justice and say that she ought to go free, he will display a lack of regard for the Law of Moses. So, instead of choosing either justice OR mercy, the Lord chooses justice AND mercy. In justice, our Lord reveals the malicious intent of the elders, and challenges any of them who have not sinned to be the first to cast a stone. There is a pious tradition that states that when our Lord bends down to start writing on the ground with his finger, that Christ writes the names of each of the scribes and Pharisees present and their sins next to their names. Note well that our Lord is not stating that only the perfectly innocent can administer justice. If that were the case, we would never have justice since no one is perfect. Instead, our Lord is pointing out the evil intent of the elders - they are not interested in true justice or in the law - they are just trying to trap Him. In mercy, our Lord forgives the woman and lets her go. However, not for a moment does our Lord trivialize her sin be reducing her guilt or place the blame on whoever committed the sin with her. He actually gives her a stern command to go and not commit this sin anymore. For ourselves, we often mistakenly think that mercy and justice are opposites. Most people think that if you are merciful, you can't be just. If you are just, you can't be merciful. In reality, mercy and justice are not opposites - they are complimentary. God is both merciful and just. He is a perfect unity and there is no division within Him. Perhaps it is helpful to think of it this way: in this life, we live in God's mercy since we have time to repent. In the life of the world to come, we will live in his justice: each will get their due. In this life, God uses justice as a way of leading us to His mercy, as a preparation for mercy. When we exact justice on a person, we can also be showing them mercy by identifying another person's wrongdoing and sin in order to lead them to seek repentance before it's too late and this life ends and they are faced with the judgment of the next life. Parents punish children in justice in order to correct faults, which is in itself and act of mercy. Parents don't punish children out of mere hate or disdain - they are trying to form their children, an act of mercy. Thus, justice prepares one for mercy. True mercy is not a type of forgiveness that turns the other way when sin is committed. A false mercy fails to recognize the gravity of a sin or chooses to place the blame on others. True mercy recognizes sin, identifies a just punishment for it and then withholds the punishment due. So, a justice that has no mercy is heartless and painful. A mercy that knows no justice is aloof and lacks accountability. When applied correctly, justice and mercy work together in harmony. One of the places within the Church that we should be able to find justice and mercy working together is in the Sacrament of Penance. In the sacrament, the priest helps the penitent to identify their sins and to see their gravity and the penitent's guilt. A good confessor will not merely write-off sins as being light matter, when in fact they admit of grave matter. Justice demands as much. Yet, rather than demand a strict recompense of justice for sin, the priest extends the mercy of Christ and remits the punishment of eternal damnation that a mere justice would require. As we approach Calvary this Holy Week, we do well to marvel and adore the mystery of the justice and mercy of the Cross. Justice demanded that we incur eternal punishment for our sins. In his infinite and divine mercy, Christ makes Himself sin for us so that He who knew no sin dies as the perfect sin-offering for us so that all who believe in Him may live and never die. Let us give thanks to the Lord for He is good - His mercy endures forever!